The idea of a temple for the Ceylon Hindu Community was first mooted on 24th December 1890, when fifty leaders of the Saivite community met at the residence of one Mr. V. Sinappah who was the Acting Traffic Inspector of the Selangor Government Railway and a very influential member of the Ceylon Tamil Community. They were anxious to have a temple in order to practice and observe the Saiva Siddhantha Tenets and religious observances such as “Viratham” (fasting), “Thithis” (commemoration rituals), “Punniyaahavaasam” (purification ceremony), “Kantha Sasthi” and so on. The matter was discussed and a decision was made to purchase an appropriate piece of land to build a place of worship and a hall. A piece of land comprising of two lots were acquired at Scott Road (presently known as Jalan Scott), Kuala Lumpur, where a large number of Ceylon Tamils lived. The Sri Kandaswamy temple was inaugurated in 1902 with the installation of the ‘Vel’ by His Holiness Sri Murugaswamy, an eminent Saivite. A small temple with walls around and a gopuram was completed and it was administered by the Selangor Ceylon Tamil Association. A Reading Room was built in 1905 with plank walls, cement flooring and attap-roof. 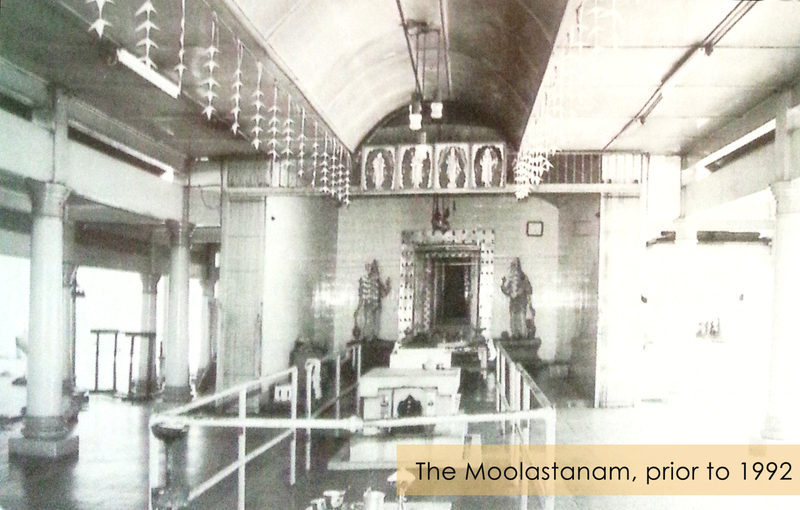 In 1910, a semi-permanent hall was built, this being the fore-runner of the present Kalamandapam. The first Maha Kumba Abishegam was held on 9th February 1909. A shrine for Lord Ganesha, the Remover of obstacles, was consecrated in 1917. 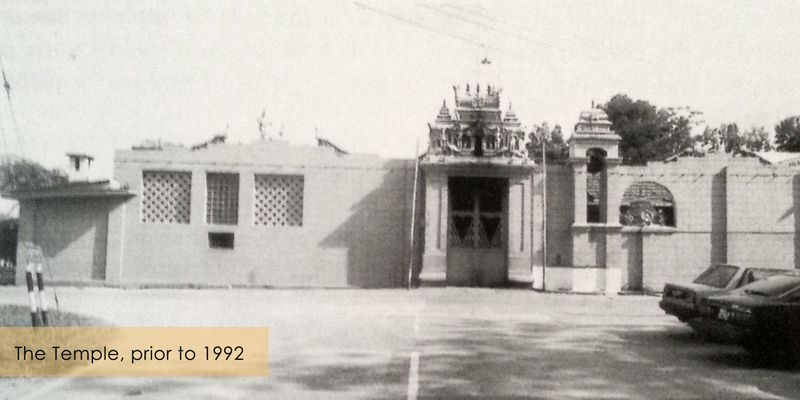 In 1927 the Selangor Ceylon Saivite Association was formed to administer and maintain the Sri Kandaswamy and the Cremation ground at Loke Yew, that was granted by the Government. On 7th August 1927, the Selangor Ceylon Saivite Association held its inaugural meeting under the chairmanship of Dr. R. Vaithilingam. The total membership then was 98. The association was officially registered and gazetted on 26th May 1928. Siva Sri R. Somaskanda kurukal was appointed on 25th May 1928 as Chief Priest of the Temple and he served the Temple with dedication for almost half a century. On 28th June 1928, Arumugaswamy with his Consorts were ceremoniously enshrined. Lord Vairavar was installed ceremoniously on 8th February 1933. Shrine for the ‘Navagraha’ was installed and consecrated during the decade (1931-1940) and the shrine for Sandeswarar was consecrated in June 1939. The Nanthavanam or Temple garden was established to provide the required flowers for daily poojas. A lotus pond with Lord Arumugaswamy seated in the centre added further beauty to the garden. A peacock and peahen were also brought in from Sri Lanka and kept in the Nanthavanam. The simple beginnings of the nanthavanam have been upgraded over the years and today it has been artistically landscaped. The beautiful peacocks, green ferns, coloured flowers and the lotus pond has now become an attraction and identity of the Temple. The Kalamandapam was officially opened by Y.A.B Tun Abdul Razak bin Dato Hussein, the Prime Minister at that time, on 25th August 1973. The building’s hall has become a popular venue for weddings, cultural shows, seminars, lectures and social functions. The Kalamandapam, the pride of the community, has been upgraded over the years and has now been fully air conditioned to accommodate current needs. In order to ensure that abishegam and poojas are conducted on time, temple staff live within the temple premises. In view of this, Management initiated the Priest and Staff Quarters project, which was completed in early 2008. A fully equipped classroom and library are also housed in this block. Regular Tamil and Tirumurai classes are also held for adults. Daily poojas, auspicious days and festivals are being observed according to the Saiva Aagamas. The performance of the various abishegams has further enhanced the divinity of the Temple. The Maha Kumbha Abishegam is regularly held once in every twelve years. Over the years, due to the highly deteriorated condition of the domes and other areas, it was decided that the Temble be reconstructed. On 24th January 1992, the Baalasthapanam ceremony was held and the new Temple was constructed. Upon completion, the Maha Kumba Abishegam was held on 24th March 1997. Twelve years had passed and necessary renovation and painting works begin after the Baalasthapanam ceremony was held on 29th April 2009. A little short of two years later, our last Maha Kumba Abishegam was grandly held on 7th February 2011. The community owes a great debt of gratitude to our fore fathers for their vision, foresight and passion to leave behind a lasting legacy in the Sri Kandaswamy Temple, modelled exactly after the Nallur Kanthaswamy Temple in the beloved mother land of Jaffna, Sri Lanka. Sheer grit, dedication and determination were the elements that has given us this rich inheritance today. We are also deeply indebted to the many Temple Management committees that have worked tirelessly to keep up this tradition. It is our sincere prayer that this divine inheritance grandly lives on for centuries to come. May the glorious Sakthi Vel Perumaan shower His blessings on all these great souls.